After a few years of unfulfilled rumors Apple finally announced its fourth-generation Apple TV set-top box today. This is the first hardware update since 2012 and includes a revised design, faster internals, a new remote, two storage options as well as features like Siri integration and a built-in App Store. On the outside the new Apple TV is still a small black rounded square and comes with all the same ports; it's just a bit taller than before. But under the hood it’s now powered by a much more powerful 64-bit A8 processor, supports 802.11ac Wi-Fi and Bluetooth 4.0, and has either 32GB or 64GB of storage. There’s also a new remote that has a glass touch surface across the top for easier navigation and a button for voice search though Siri. You’ll find the usual menu and play/pause buttons along volume and power buttons so you can control your TV or A/V receiver. It works over Bluetooth, so you don’t have to worry about where you point the remote, and has a built in rechargeable battery. The real story is in software, though. Apple says it built a new foundation for its set-top box, a brand new operating system called TV OS. The general layout looks familiar but with a fresh coat of paint and redesigned first-party apps. You can now interact with Apple TV using Siri for finding content across iTunes, Netflix, HBO, and Showtime down to very specific requests -- like finding an episode of Modern Family where Ed Norton made a cameo. You can also use Siri to search for weather conditions, sports scores or play music through Apple Music, which will also be part of the new Apple TV. 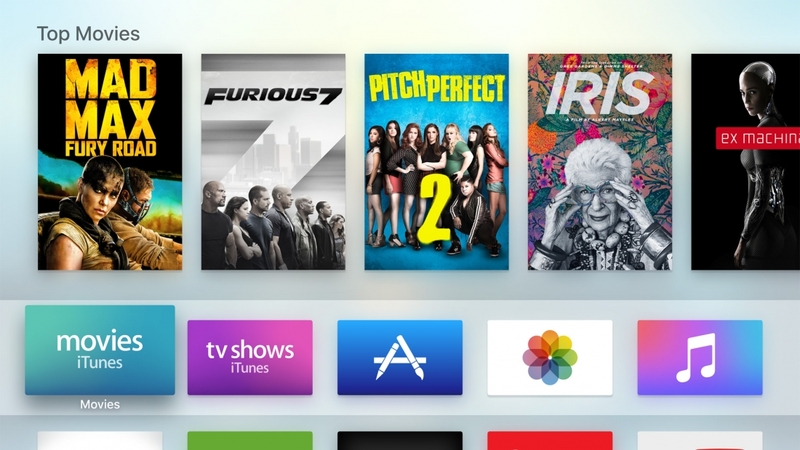 Last but not least, the much-anticipated Apple TV App Store finally made the cut. Apple highlighted a few of the new apps like Gilt, Airbnb and Crossy Road. There was a heavy focus on gaming, actually. While other streaming boxes have attempted to hype up their gaming abilities without much success, Apple is probably hoping its large and engaged developer community can craft better gaming experiences for your living room TV . The new Apple TV will launch in late October in two configurations: 32GB for $149 or 64GB for $199.